Grey relished photographic records of his exploits and travels: at center, on the Rogue River, Oregon, in 1925, and, counterclockwise, in his University of Pennsylvania baseball uniform around 1895; in Monument Valley, Utah, around 1920; and in Nova Scotia in 1924 with his 758-pound tuna, his first world record. Photomontage by Naomi Shea. Zane Grey on horseback courtesy of the Ohio Historical Society. All other photographs of Grey courtesy of his son, Loren Grey. 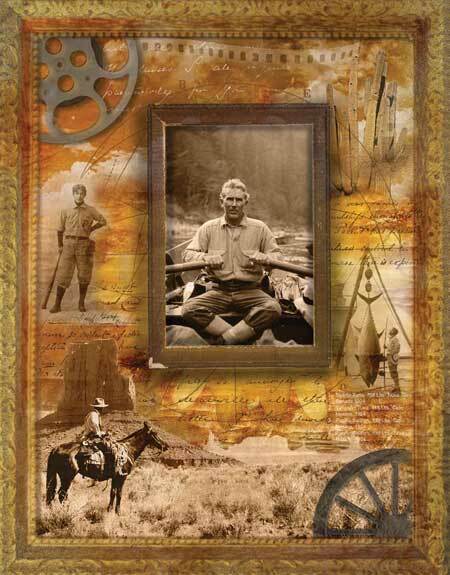 Those who’ve heard of Zane Grey usually identify him as the author of best-selling westerns, but few realize that he was the commercially most successful American author of the 1920s. Each year from 1915 to 1924, he had a new novel on the annual list of top-10 bestsellers. This achievement overlapped a boom in the motion-picture industry, provoking fierce competition for their film rights; together, the books and their many movie versions redefined the hot, desolate, nondescript Southwest as a wondrous landscape uniquely conducive to gunplay and romance. Riders of the Purple Sage, The Light of Western Stars, and The Rainbow Trail are still popular, but Greys best story may be his own colorful and remarkably little-known life. Pearl Zane Grey became a writer belatedly and most improbably. He was born in Zanesville, Ohio, a city founded by his maternal great-grandfather, Ebenezer Zane, who had distinguished himself in the Revolutionary Warexploits Grey memorialized in his earliest novels. Grey recalled his own youth as full of relentless conflicts with his stern, demanding father, a farmers son who had become a successful dentist in Zanesville. Greys delinquency and poor record in school exacerbated matters. Then, midway through his junior year, he had to drop out of high school to help his suddenly impoverished father by pulling teeth for needy locals. For diversion, Grey played baseballwith enough talent to earn scholarships to several universities. He chose the University of Pennsylvania not only for its accomplished team, but also for its dental school, which offered him immediate admission, sparing him the daunting undergraduate program. In the classroom, his four years of dental experience enabled him to slip by, but on the diamond he became the team star. After graduation, he concentrated more on baseball than dentistry, hoping to reach the major leagues, but to no avail. He retreated to a full-time practice in New York City, but quickly discovered that writing about ancestors whose lives were more distinguished and exciting than his was preferable to coping with decayed teeth and bad breath. During a summer escape in 1900 to bucolic Lackawaxen on the upper Delaware River, he met Lina Dolly Roth, 11 years younger, a New York doctors daughter who enthusiastically supported his yearning to become a writer. After their marriage in 1905, her substantial inheritance enabled him to quit dentistry and write full time. Their cross-country honeymoon trip carried them to the Grand Canyon at the dawn of its tourist appeal. Grey was captivated by the canyons natural splendor. He would return there twice more for mountain-lion hunts with rugged outdoorsmen who reminded him of Ebenezer and inspired Heritage of the Desert, his first western, published in 1910 when he was 38. For the next 15 years, he returned annually to the Southwest to find new material for more books. During the honeymoon, Grey also visited Californias Catalina Island, the recognized birthplace of saltwater angling with rod and reel. Although his first saltwater attempts there did not go well, they inspired new trips to Mexico and the Florida Keys. Eventually he returned to the intensely competitive scene in Catalina, besting and offending most members of its elite Tuna Club. In 1924, he struck out for Nova Scotia, where he landed a 758-pound tuna, his first world record, and developed an insatiable thirst for virgin seas and big fish. Purchasing a three-masted schooner, he sailed several months later for the Galpagos Islands. On later voyages to New Zealand, Tahiti, and Australia, some lasting nine months, he increased his list of records to a dozen. By 1936, he was endorsing a broad range of tackle and was widely regarded as the worlds best angler. When slugger Ted Williams, another avid fisherman, was once asked who else he would like to be, he replied, Zane Grey. A hitherto unknown aspect of these myriad excursions, whether in the Southwest or on the seven seas, is the young, beautiful, and venturesome women who accompanied Grey and, as he believed, furnished valuable inspiration. By women men live. A man is drawn unto a womanat the bottom of all the great stories lies the power of a woman, he wrote in an early journal. On his memorable first trip to Utahs Rainbow Bridge in 1913, he traveled with two of Dollys cousins, and his entourage soon expanded to four girlfriends. These relationships were seldom brief encounters or casual flings; three of the women remained with him for more than 10 years. Dolly knew about his companions and discussed them with her husband in their many letters. Despite anguish and sharp-tongued complaints, she accepted the situation because she was convinced that he was an artist and genius and she correctly understood that he probably would have been overwhelmed by his many depressions without her loyal support. (Some of the other women became her close friends and remained so long after Greys death.) Ironically, Grey made Mormon polygamists the villains of his early novels, but his letters, diaries, and personal conduct reveal that his true feelings were far more complex. I want fame, Grey boldly asserted at a low point in his early career when his submissions were routinely rejected. He then added, I want to be free. Although both his aspirations were realized beyond his wildest dreams, his driven need for bigger, better, and more gained him precious little contentment. Thomas H. Pauly ’62, professor of English at the University of Delaware, is the author of Zane Grey: His Life, His Adventures, His Women (Illinois).